I have stated numerous times that a central bank is essential. Banks take depositor;s money on demand but lend long-term. When a crisis hits, depositors want their cash and the banks has assets no cash. This is why the Fed was created with an ELASTIC money supply authority. It was to create excess cash to satisfy demand and prevent the banks from liquidating the assets that were mortgages or business loans. Creating money was to ease the stress and lessen the volatility. The Fed was correctly designed insofar it would stimulate the economy by purchasing corporate paper (NOT GOVERNMENT) thereby directly helping to save jobs lending to corporations when banks were cash poor. Each branch had its independence to maintain interest rates based upon local conditions. This combined with the ELASTIC powers made sense and was truly a brilliant concept that would have helped the economy. Then came World War I and politicians. They directed the Fed to buy GOVERNMENT PAPER to fund the war. After the war, they never rescinded that order. Then comes the Great Depression and then World War II. They usurp the branch independence folding that into a single interest rate for the whole nation. Then the ordered the Fed to buy government paper at par to prevent interest rates from rising during the war that lasted until 1951. 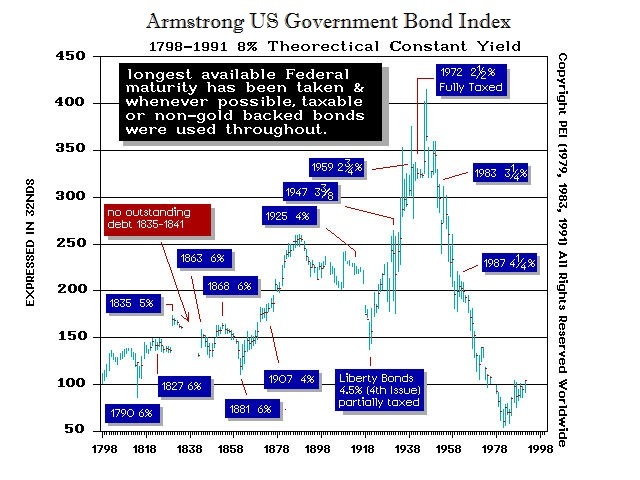 You can see that the bond market then crashed into 1981 for nearly 31 years. Then comes the 2007 Crash. The Fed is now to support every sector within the economy and is by no means anything close to what it once was supposed to be, It is not a pure central bank. It is supposed to sterilize the wrong decisions of Congress. So Congress and do as it likes, and the Fed has to clean it up. Now even Paul Volcker has come out and said the Fed as it is structured today is WRONG! We have lost our central bank and nobody knows what the Fed has become. It is just insane. « New York lost the Status of Financial Capital of the World. Who has it Now?